The Fukushima Global Communication Programme (FGC) was launched at a parallel session as part of the International Forum for Sustainable Asia and the Pacific (ISAP) 2013 conference in Yokohama on Tuesday, 23 July 2013. The FGC uses a human security approach to consider the human consequences of the nuclear accident at the Fukushima Daiichi nuclear power plant. Through intensive research and data collection, the UNU Institute for Sustainability and Peace (UNU-ISP) aims to become an important platform for collating and disseminating information on what has become the second-worst nuclear accident in human history. Prof. Kazuhiko Takeuchi, Director of UNU-ISP, gave a keynote lecture introducing the programme. He explained that UNU-ISP is well suited for undertaking this project on the Fukushima disaster, given the unique status of UNU as the only UN agency headquartered in Japan, and its strong reputation as a “neutral” organization. He noted that UNU “can facilitate communication in both directions: we can disseminate knowledge and information from Japan to the international community, while also helping to channel and share valuable international expertise that is relevant for managing the situation in Fukushima”. Communicating information and sharing findings with the international community. 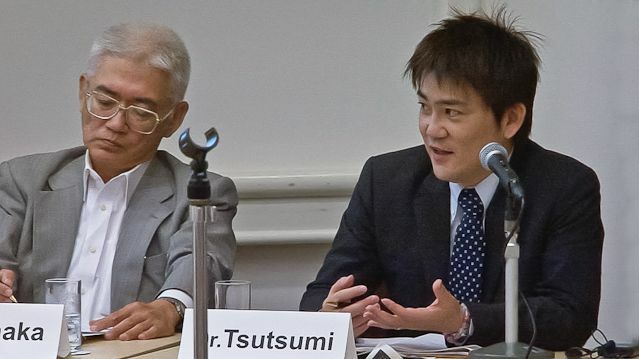 Prof. Takeuchi explained that the project is unique in adopting a human security approach because “in responding to the Fukushima disaster, a perspective is required that restores the security of people as the primary concern in policymaking”. The keynote address was followed by a panel discussion chaired by Kazuhiko Takemoto, (Senior Fellow, UNU-IAS), who heads the programme’s secretariat. Dr. Madoka Futamura (Academic Officer, UNU-ISP), who is a programme researcher, also gave a presentation. Using a human security approach, she focused on gender issues that arise in the context of natural disasters, highlighting a wide range of problems such as the increase in sexual violence and domestic abuse, gendered property rights, and the specific harms that men, women, and transgender people are exposed to. She noted that a gender lens encourages us to ask, during the rebuilding stage, “What kind of society to be rebuilt, for whom?”. The next presentation was from Dr. Atsuro Tsutsumi, (Research Fellow, UNU-IIGH) who is also a member of the FGC’s High-Level Advisory Committee (HAC). He discussed the major mental health issues that emerge after natural disasters. 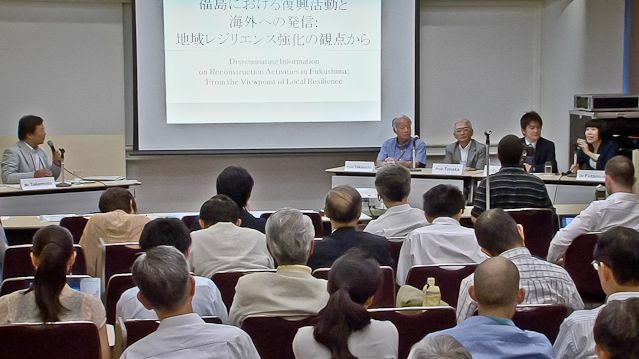 Dr. Tsutsumi noted that a range of problems had emerged after Japan’s “triple disasters”, including depression, anxiety, harmful rumours, bullying and discrimination, as well as a lack of support for people with mental disabilities. He suggested that it is necessary to incorporate mental and psychosocial perspectives into any disaster risk management policies, and that focusing on these issues is necessary in order to “build back better” after a disaster. The final presentation was by Prof. Satoru Tanaka of the University of Tokyo, who is a member of the HAC. Prof. Tanaka talked about decontamination efforts in Fukushima, noting that even for people who are able to return, it may be difficult to provide them with the jobs and services they need. He observed that the region has a large number of farmers, and it has been very difficult for them, as they have not been able to cultivate and sell their crops and livestock. See the Fukushima Global Communication Programme website for more information.